They have exceptional control and performance and the lifetime cost of ownership is lower than alternative. Rosahl uses a small electrical charge (3V dc) across the solid state polymer membrane. This breaks down moisture and expels it from the enclosure. The normal operating range is 20 to 80% RH but the system will operate at lower levels RH if required. A humidity controller is recommended as the Rosahl membrane will dehumidify an appropriately sized container to below 10% RH. This may be unsuitable for some natural materials. Rosahl can be integrated into an existing installation or incorporated into an overall environmental control system. It can be supplied as a membrane only or incorporated into a power supply. A number of manufacturers use Rosahl in the construction of museum cabinets for the preservation of artefacts. 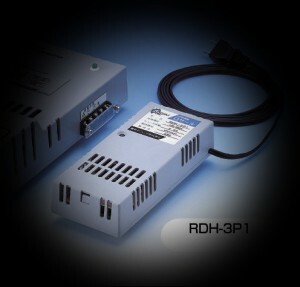 The RDH-3P2 shown above includes a membrane and power supply suitable for 220/240 installation. It is not CE marked but is RoHS compliant. It does not include a local humidity controller. ROSAHL was developed by Mitsubishi Electric Corporation member Ryosai Technica Company in Japan. It was in response to a demand for compact maintenance free, air drying to protect sensitive equipment from moisture damage. It has since found its way into applications such as museum display cabinets, telecommunications equipment, manufacturing processes and electrical cabinets. The smallest model is 25% the size of an AA battery and requires only a 3 Volt dc supply. For an introduction to the range of Rosahl membranes and accessories go to the Products section of this website. For information on the application and selection of Rosahl go to Selecting the correct membrane.